I’ll just come right out and say it: of all the garden work, I love turning and sifting compost most! Yesterday was Amie’s first extended day at Kindergarten and the weather was glorious to boot. That left me with five (5) whole hours in the garden. I filled milk bottles with rain water as biomass for the hoop house and, while placing them, noticed that the plants were looking a bit glum. Time for the last compost dressing of the season, and then a good soak. 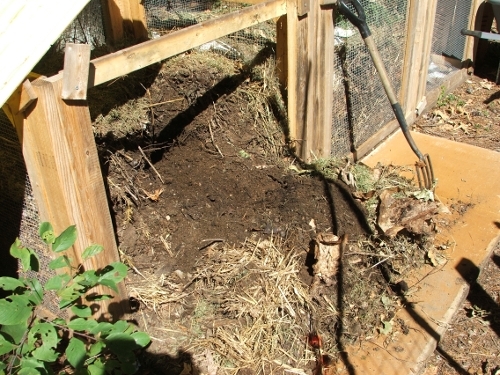 … a lot of good, finished compost from the center of the pile. I shoveled most of this soft, small stuff through my mesh, over into the third, empty bin, shoving the leftover bulky stuff into the middle bin. When bin 1 was empty, I moved most of the bulky stuff now in bin 2 into bin 1, and sifted the rest of bin 2 into bin 3. The bulky stuff ended up in bin 1. It was an elaborate and no doubt illogical process but I ended up with bin 3 full of finished compost, bin 1 half full of unfinished stuff. As you can see in the first picture, all but the centers of the heaps had become too dry, so I made sure to saturate the new unfinished bin with rain water. After this good turning and soaking I hope it will finish in a week or two, at which point I’ll sift it again. 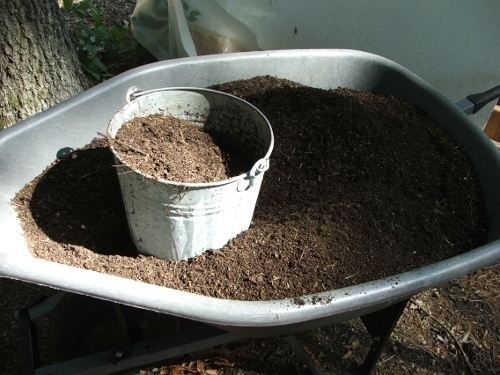 Bin 3 now held 2 wheel barrow loads of fragrant, fluffy compost. 1 load has already been distributed among the tomato, pepper and eggplants, the herbs, carrots and peas. I put 2 handfuls around the base of each plant, then water it in (with rainwater, of course). 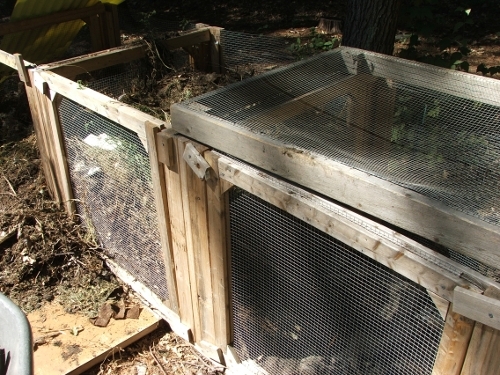 I covered bin 3, so yesterday night’s rain won’t leach the compost too much. One Straw, by the way, has an interesting post on soaking up the leached nutrients with biochar. Following his advice on my own much smaller scale, I put whatever leftovers of charcoal at the bottom of the bin. Today (weather and soil humidity permitting) I’ll work the other load into the empty beds so they’ll be ready for the Fall and Winter seedlings. Time to get out the hoops, the row cover and the plastic. And the gardening books.